AFL Fantasy 2017 is open! Yep, it’s open and we are stoked. The 2017 game is now open! You beaut! 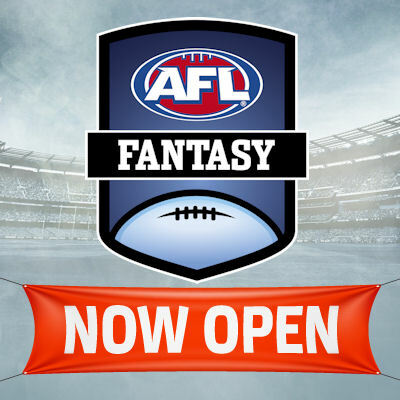 Head to fantasy.afl.com.au right now to start picking your squad, setting up your leagues and checking out the site. The major prize is a ripper – a new Toyota Hilux. It’s great to have a car back… and a good one at that! Some site design changes and features will roll out over the next few weeks. Smartphone apps – they will be available soon. Takes times to get them through the stores. Post leagues, etc in the comments below! not open in WA ???? Try clearing your cache or using another browser to get the new site happening. Mzungu is currently spelt with a capital Z in Fantasy Warnie (MZungu); should let someone know so they can fix that up! Ta. I’ll pass those one. Player imaging is a hard one as not all clubs have had new shots taken. And Watson has no picture. There has to be a hipster barista picture of him somewhere they can utilise….. Big issues being covered early..
Hahaha… yes! Not sure what happened there. They were sucking out 2015 pics for the banned Bombers. Although, how much better are the grey silhouettes rather than the harsh black ones. One of my suggestions that went through! ;) Design genius. Will being able to remove Round 9 as a game to play in leagues become an option? Isnt at the moment. I think it’s staying as is. Sorry. Weekly prizes have been that for the last couple of seasons and unfortunately, there hasn’t been an Eliminator comp for the last three seasons. you guys got any more complaints? Jesus’s. Players who received discounts (under 10 games played in 2016) had their % discount applied to the higher of the last two years averages to avoid ridiculously low pricing – as seen in other formats. Hughes was an anomaly… however, in my opinion, better to stick with a formula and being too high than doing arbitrary pricing that got people complaining last year. Fiorini is one that will continue to pop up in conversation. Again, we’ve stuck to the formula to keep people happy (I have seen the same same ones sooking again!! haha)… but he does get a 24% discount on his 2016 average of 111.5. The gripe should be with him for dominating so hard in the last game!! Cheers, makes sense! Not that anyone would realistically be picking Hughes anyway! thanks how do we rejoin it? Soon… no set date yet because we don’t know it (app store process among other things). Is anyone else having difficulty swapping their profile photo from last year to a new one? Every time I upload a new image and click update, it never saves. Not a biggie, but it’s annoying. I think this is a known issue. I was able to change mine today, though. Probably too late for this season, but could you pass on a suggestions to the game devs that we be given the option on how to rank teams on the same points on classic/draft league ladders? Currently its worked out by points for/against % (like the AFL ladder), but it would be great to have the option to rank teams by “Points For” purely. It rewards the best team, and in Fantasy (unlike in the real game) the opposition does not affect your own point scoring. Makes absolutely no sense to have % as the tiebreaker when you have no ability to affect your opponents score. I put that to them a couple of years ago… no dice. Hoping to get some suggestions rolling through earlier this year so that they can be included in the 2018 roadmap. DT Talk community will definitely have a say!